Irrespective of what the government does, the private domestic sector can save overall, as long as the net exports are positive. This is a question about the relative magnitude of the sectoral balances – the government fiscal balance, the external balance and the private domestic balance. The balances taken together always add to zero because they are derived as an accounting identity from the national accounts. The balances reflect the underlying economic behaviour in each sector which is interdependent – given this is a macroeconomic system we are considering. The following graph with accompanying data table lets you see the evolution of the balances expressed in terms of percent of GDP. 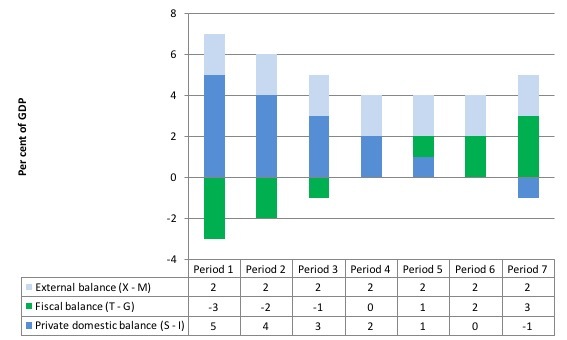 In each period I just held the fiscal balance at a constant surplus (2 per cent of GDP) (green bars). This is is artificial because as economic activity changes the automatic stabilisers would lead to endogenous changes in the fiscal balance. But we will just assume there is no change for simplicity. It doesn’t violate the logic. To aid interpretation remember that (I-S) > 0 means that the private domestic sector is spending more than they are earning; that (G-T) < 0 means that the government is running a surplus because T > G; and (X-M) < 0 means the external position is in deficit because imports are greater than exports. If the nation is running an external surplus it means that the contribution to aggregate demand from the external sector is positive – that is net addition to spending which would increase output and national income. The external surplus also means that foreigners are decreasing financial claims denominated in the local currency. Given that exports represent a real cost and imports a real benefit, the motivation for a nation running a net exports surplus (the exporting nation in this case) must be to accumulate financial claims (assets) denominated in the currency of the nation running the external deficit. A fiscal surplus means the government is spending less than it is taking out of the economy via taxations which puts a drag on aggregate demand and constrains the ability of the economy to grow. So the question is what are the relative magnitudes of the external add and the fiscal subtract from income? The following graph shows the range of options for a given external surplus (of 2 per cent of GDP). In Periods 1 to 5, the private sector is saving because the public sector does not negate the overall contribution of the external sector to demand and hence growth. Clearly, the larger is the fiscal deficit the greater is the capacity of the private sector to save overall because the growth in income would be stronger. In Periods 4 and 5, the fiscal position moves from deficit to balance then surplus, yet the private sector can still net save. That is because the fiscal drag coming from the fiscal position in Period 4 is zero and in Period 5 less than the aggregate demand add derived from the external sector. In Periods 6 and 7, the private sector stops net saving because the fiscal drag coming from the fiscal surplus offsets (Period 6) and then overwhelms (Period 7) the aggregate demand add from the external sector. The general rule when the economy runs an external surplus is that the private domestic sector will be able to net save if the fiscal surplus is less than the external surplus. A rising government deficit indicates that the government fiscal stance is becoming more expansionary. Intuitively, we might think that if the deficit rises the government must be pursuing an expansionary fiscal policy. But intuition is not always a good guide and doesn’t replace understanding. The question is exploring the issue of decomposing the observed fiscal balance into the discretionary (now called structural) and cyclical components. The latter component is driven by the automatic stabilisers that are in-built into the fiscal process. The fiscal balance is the difference between total government revenue and total government outlays. So if total revenue is greater than outlays, the fiscal position is in surplus and vice versa. It is a simple matter of accounting with no theory involved. However, the fiscal balance is used by all and sundry to indicate the fiscal stance of the government. The Full Employment Budget Balance was a hypothetical construct of the fiscal balance that would be realised if the economy was operating at potential or full employment. In other words, calibrating the fiscal position (and the underlying fiscal parameters) against some fixed point (full capacity) eliminated the cyclical component – the swings in activity around full employment. The logic of the Greek bailout packages is to force the government to run primary fiscal surpluses. This is because posting primary surpluses is the only way to reduce Greece’s public debt ratio. While Modern Monetary Theory (MMT) places no particular importance in the public debt to GDP ratio for a sovereign government, given that insolvency is not an issue, the mainstream debate is dominated by the concept. The unnecessary practice of fiat currency-issuing governments of issuing public debt $-for-$ to match public net spending (deficits) ensures that the debt levels will always rise when there are deficits. But the rising debt levels do not necessarily have to rise at the same rate as GDP grows. The question is about the debt ratio not the level of debt per se. Rising deficits often are associated with declining economic activity (especially if there is no evidence of accelerating inflation) which suggests that the debt/GDP ratio may be rising because the denominator is also likely to be falling or rising below trend. You can read this in English as saying that Fiscal deficit = Government spending + Government interest payments – Tax receipts must equal (be “financed” by) a change in Bonds (B) and/or a change in high powered money (H). The triangle sign (delta) is just shorthand for the change in a variable. However, this is merely an accounting statement. In a stock-flow consistent macroeconomics, this statement will always hold. That is, it has to be true if all the transactions between the government and non-government sector have been correctly added and subtracted. For a sovereign government that issues its own currency, the previous equation is just an ex post accounting identity that has to be true by definition and has no real economic importance. However, for Greece, which has ceded its currency sovereignty, the GBC becomes an financial constraints given that it has to fund its spending from taxation and/or bond issues. A primary fiscal balance is the difference between government spending (excluding interest rate servicing) and taxation revenue. The standard mainstream framework is usually expressed in terms of the ratio of debt to GDP rather than the level of debt per se. Even so-called progressives (deficit-doves) use this framework as if it applies to all governments. This standard mainstream framework is used to highlight the dangers of running deficits. But even progressives (not me) use it in a perverse way to justify deficits in a downturn balanced by surpluses in the upturn. Many mainstream economists and a fair number of so-called progressive economists say that governments should as some point in the business cycle run primary surpluses (taxation revenue in excess of non-interest government spending) to start reducing the debt ratio back to “safe” territory. Almost all the media commentators that you read on this topic take it for granted that the only way to reduce the public debt ratio is to run primary surpluses. That is what the whole “credible exit strategy” rhetoric is about and what is driving the austerity push around the world at present. So the question is whether continuous national governments deficits imply continuously rising public debt levels as a percentage of GDP and whether primary fiscal surpluses are required to reduce the public debt ratio. While MMT advocates running fiscal deficits when they are necessary to fill a spending gap left by non-government saving, it also emphasises that a government running a deficit can also reduce the debt ratio if it stimulates growth. The standard formula above can easily demonstrate that a nation running a primary deficit can reduce its public debt ratio over time. Here is why that is the case. A growing economy can absorb more debt and keep the debt ratio constant or falling. 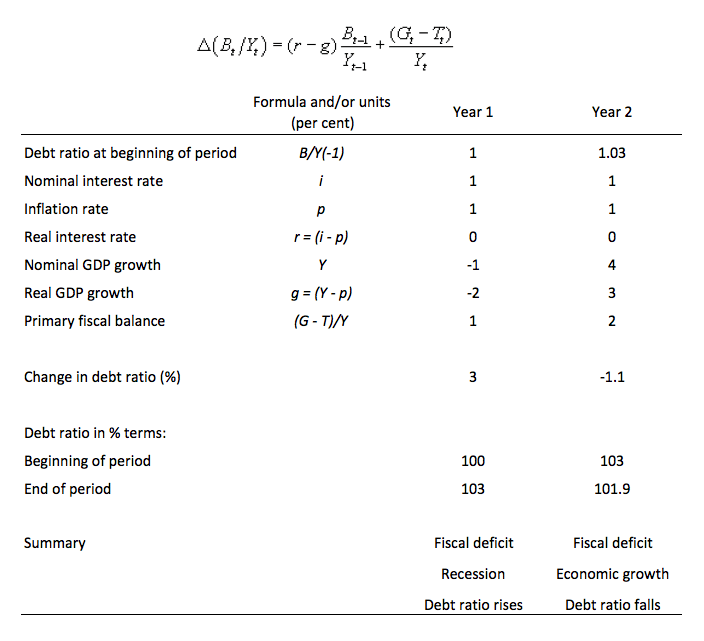 From the formula above, if the primary fiscal balance is zero, public debt increases at a rate r but the public debt ratio increases at r – g.
The orthodox economists use this analysis to argue that permanent deficits are bad because the financial markets will “penalise” a government living on debt. If the public debt ratio is “too high” (whatever that is or means), markets “lose faith” in the government. Consider the following Table which shows two years in the life of an economy. It keeps things simple by assuming a public debt ratio at the start of the period of 100 per cent (so B/Y(-1) = 1). Assume that the real rate of interest is 0 (so the nominal interest rate equals the inflation rate) – not to dissimilar to the situation at present in many countries. Assume that the rate of real GDP growth is minus 2 per cent (that is, the nation is in recession) and the automatic stabilisers push the primary fiscal balance into deficit equal to 1 per cent of GDP. As a consequence, the public debt ratio will rise by 3 per cent. So in Year 2, the debt ratio is 1.03 of GDP. The government reacts to the recession in the correct manner and increases its discretionary net spending to take the deficit in Year 2 to 2 per cent of GDP (noting a positive number in this instance is a deficit). The central bank maintains its zero interest rate policy and the inflation rate also remains at zero so the real interest rate doesn’t move. The increasing deficit stimulates economic growth in Year 2 such that real GDP grows by 3 per cent. In this case the public debt ratio falls by 1 per cent. In other words, Greece does not have to run fiscal surpluses to bring its public debt ratio down. What it needs is growth and that is more likely to occur if it holds its nerve and runs deficits. The problem is that the membership of the EMU (lack of currency sovereignty) makes that difficult without ECB support. I`ll throw this one out again….. Assuming external(BOP) deficits,run the required fiscal deficits. ignore a “target” interest rate, pay interest on reserves and impose a minimum deposit rate leaving for eg. a 2% spared. The two rates then move dynamically depending on liquidity in the system but maintain the spread……Issue treasury paper only for the sake of household savings, forcing institutions to invest in the real economy. What am I missing here? any takers? PhilipO, I think you can ignore the balance of payments if the country is happy to allow the foreign exchange market to provide the valuation of its currency. If you pay interest on reserves, that rate is now your “target” rate if you do nothing else. It will be the minimum rate that banks will consider lending at. I don’t really understand what you mean by ‘minimum deposit rate’, but it will not move dynamically or otherwise if it is set by law and tied to the interest on reserves rate. Nor will the interest on reserves rate move unless that is the policy desired. I know you asked this before and I really don’t have the answer, but that is my best guess at it. The answer is indeed false, as Prof. Mitchell concludes. However, in ordinary language it is not correct to say “This is a question about the relative magnitude of the sectoral balances”. Sectoral balances are merely ex post accounting, true by definition but incapable of providing any explanation of economic causes and effects. Private sector savings do not depend on sectoral balances, so the latter are rather irrelevant to the question. So what determines whether “the private domestic sector can save overall”?. The answer is simple – it can save if it has income greater than the minimum subsistence level. This requires aggregate demand must be above a minimum subsistence level. Income can be be above subsistence level with with positive savings and positive net exports, e.g. Germany and China, or with positive saving and negative net exports, e.g. USA and UK, so the answer to Q1 is obviously false!